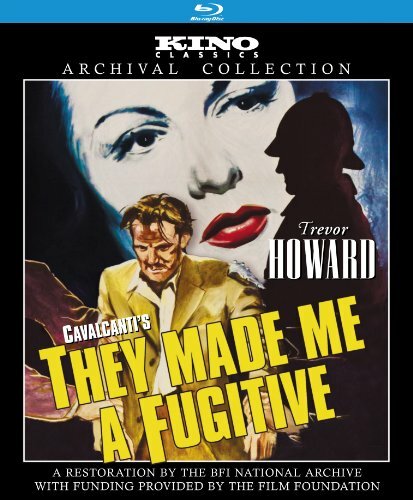 Kino Classics announces the Blu-ray release f They Made Me a Fugitive from director Alberto Cavalcanti, a gripping, taut suspense thriller set on the streets of post-WWII London. Trevor Howard stars as Clem, a hardened and disillusioned ex-serviceman who gets drawn in to the dangerous and thrilling world of black-marketeering. New York, NY - July 5, 2012 - Kino Classics is proud to announce the Blu-ray release of They Made Me a Fugitive (1947), from director Alberto Cavalcanti (Went the Day Well? ), a gripping, taut suspense thriller set on the streets of post-WWII London. This Kino Classics Archival Collection edition is mastered from the restoration by the BFI National Film Archive, with funding provided by The Film Foundation. Set to street on July 24th, They Made Me a Fugitive comes to Blu-ray with a SRP of $29.95. It is currently available for prebook. Trevor Howard (Brief Encounter, The Third Man) stars as Clem, a hardened and disillusioned ex-serviceman who gets drawn in to the dangerous and thrilling world of black-marketeering in the seedy underbelly of post-WWII London. He works for a psychotic crime boss, Narcy (Griffith Jones), who betrays him when Clem refuses to deal drugs, setting off an intense revenge story in the best film noir tradition. Released in the US under the title I Became a Criminal, the film is a classic of British film noir. Cavalcanti sets this gripping thriller in the picturesque Soho district, infusing the brooding images of London pubs, back alleys and bedrooms with poetic urban realism, enhanced by shadowy cinematography by Otto Heller.